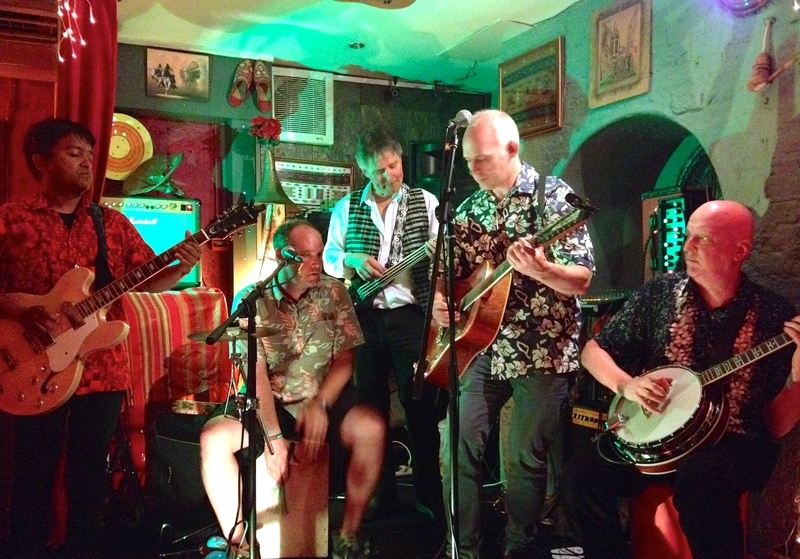 In the last year or so, The Shakespeare Heptet have morphed from a beguiling two guitar two piece, (with the shade of Shakespeare making up the former Shakespeare Trio) into the barnstorming Shakespeare Heptet who, in its current iteration, also features percussion, bass and banjo. The result is that their mix of blues, folk and magpied scraps of bluegrass, eastern, medieval now has added oomph and dynamics. Sparking the genteel audience at The Blue Man on Queens Street, Brighton, clapping along and contributing the odd oooh or la-la-la to the proceedings. The fact is this music is fantastic, and even if you have no interest in the Bard it doesn’t really matter. So what of Shakespeare in all this? Setting Shakespeare’s sonnets to music has been done before of course, but never with such persistent single mindedness as by band leader Richard Gibson whose highly intelligent interpretation of Shakespeare’s sonnets is based on several years engagement with them. The Shakespeare that emerges is no fossil. The sonnets are full of disappointing human relationships, passion, hurt, vengeful feelings and love. In other words this Shakespeare is completely alive and kicking. It’s a heady mix for an evening out – and music this good needs to be heard. You can catch the Shakespeare Heptet one more night at The Blue Man Queens Street Brighton at 8:30 on 17th May 2014. This entry was posted in Brighton Fringe, Music and tagged Brighton, Brighton Fringe, Richard Gibson, The Blue Man, The Shakespeare Heptet. Bookmark the permalink.